necessary, we are ready to bring cases to trial. Founded in 2012, Schulman Law solves problems. Schulman Law creates uniquely-tailored approaches to serve each client’s needs. Whether it be the victim of civil rights abuses, a criminal defendant in a courtroom, or a corporate subject of a regulatory investigation, each client receives the necessary attention to guide them through the legal process and achieve the best possible result. Schulman Law recognizes that each client’s legal matter requires a specific approach to help achieve the best result. Schulman Law draws from a background of diverse legal representation and government service. We have achieved impressive results on behalf of victims of civil rights abuse, criminal defendants, and companies subject to governmental investigations. Schulman Law appreciates the hard work, commitment, and good judgment necessary to achieve success in legal matters. At its core, Schulman Law is comfortable in any legal forum and in any community. Schulman Law consists of trial attorneys who know no bounds in ensuring the proper paths are followed to achieve the best result. Schulman Law has been successful in both federal and state courts, including jury trials, bench trials, arbitrations, and mediations. Schulman Law focuses on police and government abuses, which take many forms and effect different types of victims in different ways. We have successfully handled cases involving police brutality, police misconduct, false arrest, discrimination, and criminal matters, and investigative issues. Our clients come from a diverse background of different races, ages, education levels, occupations, and political views. The unifying theme is that our clients have all been educated in the "University of Life" and we are committed to vindicating our clients' rights and fights abuses of power. Peralta v. City of New York, et al. : $725,000 recovery, in addition to waiver of all medical and public assistance liens, for man shot running away from the police, later to be found in possession of a quantity of narcotics. Robles v. City of New York, et al. : $350,000 recovery for man incarcerated for eight months for a crime he did not commit, despite the fact that a grand jury indicted based on the testimony of the fabricating, complaining witness. Benavides v. City of New York, et al. : Defense verdict in Supreme Court, Bronx County. Plaintiff alleged civil rights violations for excessive force after allegedly being thrown off the top of a 15-foot fence by a police officer. Plaintiff sustained bilateral leg fractures and underwent numerous surgeries. The jury found the officer used reasonable force in arresting plaintiff and plaintiff jumped off the fence, rather than being pushed. Caldwell v. Dennis Vickery, et al. : Motor vehicle accident involving police motorcycle that struck Plaintiff as Plaintiff crossed the Grand Concourse in Bronx County. Based on an extensive review of the medical situation, plaintiff was convinced to settle for far less than the initial demand. Paley, et al. v. City of New York, et al. : Defense verdict in Supreme Court, Bronx County. Plaintiffs alleged federal civil rights violations for police excessive force during enforcement of a court ordered eviction. Jury found in the officers’ favor and determined that officers used reasonable force. Thomas v. City of New York, et al. : Defense verdict in Supreme Court, Bronx County. 13-year- old Plaintiff sustained a fractured elbow requiring numerous surgeries and causing severe arm-shortening after falling in a tree-well owned and maintained by the City. The City had prior notice of the defect and Plaintiff rejected a $750,000 settlement offer. The jury found the defect was not the cause of the injury. Bryan v. 250 Church Associates, et al. : Premises liability case involving City employee seriously injured by a falling window while working. Workers Compensation law barred a direct suit against the City, but the City was impleaded under a contractual indemnification clause. After a lengthy trial, the City collected on a $200,000 Workers Compensation lien and contributed nothing to the $700,000 settlement. McQueen v. City of New York: Verdict Search Reporter “Big Defense Win of 2008.” Police officers shot and killed an unarmed participant in a Brooklyn gas station robbery. The judge granted summary judgment by finding the shooting justified as a matter of law and dismissed the Complaint. Schulman Law has been involved in communal activities including a mock trial competition for New York City public school junior high-schoolers and Schulman Law is a proud sponsor of the Hoops in the Sun Roundball Classic and Rising Suns Leagues, annual basketball tournaments held each summer at Orchard Beach in the Bronx. 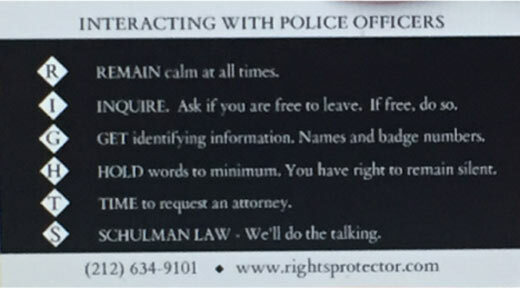 Schulman Law is available to provide “Know Your Rights” informational seminars upon request.